MetaMask and EtherDelta work great together, as long as you know how to use them. One of the most common ways people get confused when using EtherDelta is with account management, and it can be scary, because mis-managing an account can mean losing it, and all the funds you put in it! The first thing to know about EtherDelta is that it has its own current account. This sometimes is the same as the MetaMask current account, but not always! EtherDelta also allows users to not use MetaMask at all, which means trusting the site with your private keys. 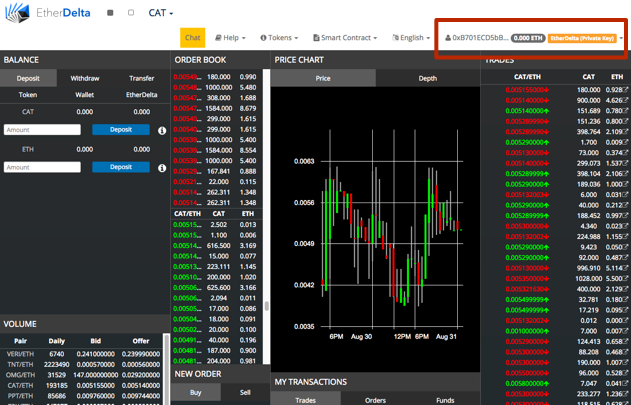 The current account menu is always accessible in the top right corner of EtherDelta. You might notice that the current account up there says "No Private Key". If you click the menu, you'll see a message like this next to each account, and each of these messages means a specific thing, and it's important to understand these. Let's discuss these, one at a time. An account labeled "MetaMask" is an account that is currently unlocked with MetaMask. This is usually the account you want to use! If you want to use a different MetaMask account, you should open MetaMask, and select a different account. An account labeled "No Private Key" means this account was previously connected with an Ethereum browser like MetaMask. EtherDelta isn't sure where this account went, all it knows is that you had it before, and so EtherDelta lets you view this account's balance and details, even without signing into it with MetaMask. An account labeled "Private Key" means that EtherDelta holds the private key to this account. This is not a MetaMask account, and it is not backed up with your seed phrase. When you see this screen, you absolutely must back up that private key, or you will lose this account and all of its contents if your computer crashes or has a hard drive failure. It is your responsibility to back this up, and if you don't, there's nothing that MetaMask or EtherDelta support can do for you. It's not uncommon for users to create a new "Private Key" account, and think it's backed up with their MetaMask seed phrase. If you assume this, and then use a different computer, you can be in for a big surprise when you learn that you lost your exchange account and all of its holdings. The only way to protect yourself from problems like this is to always read warning messages when using Ethereum sites, especially ones about backing up private keys or site secrets, because they can hold everything you have on that site. I Have Tokens Stored On My MetaMask Account - Now What?